Well, this entry is eleven days late, I'm not going to lie. Earlier of the month I did mention that I hoped to blog everyday.. well.. that's that. I haven't had as much fun as I did on my birthday weekend and I guess I just couldn't get myself to sit in front of my netbook long enough to write an entry. Can I just say.. I LOVE it when my birthday falls on a Friday? There is just something awesome about Friday 13th, really.. The week was wonderful to begin with anyway. Flying with Bestie and people I'm actually familiar with really helped. We were rushing through the terminal when the clock turned twelve so that was a bit "ick" but it was alright. I really enjoyed the trip so I was in no hurry to get away from my colleagues. Daybreak came, and I got to hang out with Bestie (again, as if the trip wasn't enough!) and my favourite ladies. Had a good lunch at Bubba Gump, exchanged gifts (Mumu's birthday on the 17th! ), enjoyed some coffee and smokes.. Our normal day out, really! 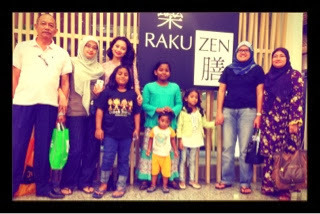 Then I spent the evening with my family, had a goood dinner at Rakuzen and Kina and the kids were there too! Like seriously, the day was perfect. It was a PERFECT day, and for that, Alhamdulillah.. Anyway, what have you missed since my last entry? Nothing much other than my birthday! 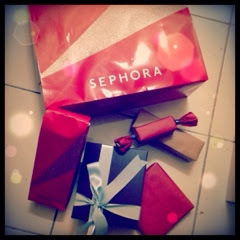 I did some more shopping since payday came early and I had 10% off from Sephora. HAHHAHAHHA!! So I'll probably talk about those things before the year ends. I also got some incredible presents that I just can't wrap my head around.. I am going back on entries #11 and #10 as I have a little more to add to them. Hopefully that happens after I come back from flight tonight. Life's been good. It's been an incredible month so far and I am just.. full.